Home / Unlabelled / Duterte personally confronted Robredo on ouster rallies: Bakit mo ako gusto paalisin? 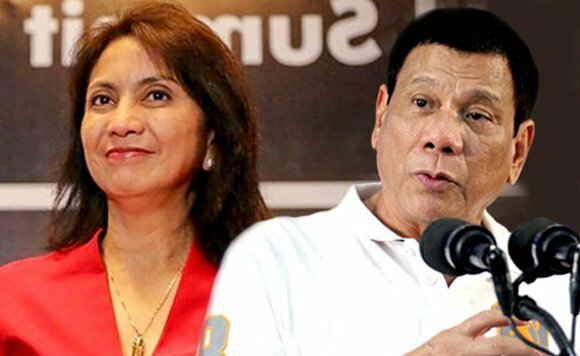 Duterte personally confronted Robredo on ouster rallies: Bakit mo ako gusto paalisin? President Rodrigo Duterte in an interview with TV 5’s Luchi Cruz-Valdes, he revealed that he personally confronted Vice President Leni Robredo on her attendance seeking his ouster. “Well, nung makita ko siya doon sa gate, hindi ko naman siya pwede tanungin.. ito Leni wag kang magalit, istorya lang ito. Istorya lang. ‘Uy, bakit ka nandyan.. bakit mo ako gusto paalisin? Magkasama tayo sa opisina. Magkaharap nga tayo.’ So, first to hit ako,” Duterte said. “Ang problema ko kay Leni, makikita ko pa siya sa ‘down with Duterte.. oust Duterte.’ Then kapag two weeks after mag-Cabinet meeting kami magkaharap.. magkaharap kami kasi Vice President siya eh. So don’t you think this is a little bit of incongruity here? What do you think?” said Duterte. He was referring to Leni’s attendance on Nov.30 at a Bantayog ng mga Bayani event honring martial law victims. Recently, President Duterte told to Leni that he didn’t want to see her face in the Cabinet meetings starting Dec.5. After that, Rebredo resigned as chair of the Housing and Urban Development Coordinating council. According to President Duterte, he had the best intention when he personally called Leni to invite her to join his Cabinet. “Sabi ko bigyan ko yung posisyon na busy talaga and a productive position. Ako, nagmagandang loob naman, and also because I think it was really a valid criticism, na why don’t you just get this girl into the, no not into the wagon. And right with the—e di tinawagan ko sabi ma’am, so I saw the rationale and it was a good one. But you might as well, you know, utilized the expertise. She’s a lawyer,” said Duterte.